The trials of being a writer never seem to end. There's the struggle to find the time to write, having to put up with everyone else fancying doing a little writing when they've got a spare moment, the agonies of submission, rejection, submission, rejection, submission – and then suddenly the miracle of acceptance. After that, you have to ensure you come out of negotiations with your publisher with your shirt still on your back and without having to offer up your first-born child, then build up a relationship with your editor, stay calm and not take out a contract out on your copy editor, and be thrilled that your book has a cover, even if the artist apparently never read the book it's wrapped round. But the book is in the shops and the fun starts, right? W-e-l-l, not exactly. Yes, you'll receive invitations to do this, attend that, sign here, read there, and it will all seem absolutely wonderful … what Thomas Lynch, the writer and undertaker, calls a 'whiff of delectable celebrity', describing a trip to the Aldeburgh International Poetry Festival. 'We were like rock-and-roll stars on tour, he writes – and can you not hear the slight pause as Hubris and Nemesis consult as to what his downfall is to be (a modest failure to realise that the familiar face he was talking to was not from Milford, Michigan, except by way of a cinema screen – Ralph Fiennes). Lynch's sin was not a great one in the annals of authorly faux-pas, nor even was André Brink's, a comment about a woman, made in a nervous, desperate effort at conversation to the publisher he hoped would take on his novel – a shame it was the publisher's wife he'd just been rude about. Julian Barnes, at his first literary party, secured a few moments' conversation with the legendary Tom Maschler, who was his publisher at that point (a story in an anthology), which faltered at the twin stumbling blocks of Maschler's not recognising his name (not an uncommon experience for authors, I gather) and Barnes being unable to recall the title of his own story. But these things happen. Adam Thorpe's attempt to interview his hero, Josef Brodsky, becomes tangled in Brodsky's dislike of being interviewed, while Colm Toíbín loses most of his tv interview slot to Norman Mailer's failure to keep to time. Roddy Doyle totally fails to live up to the expectations of his German 'handler' by not being a rip-roaring 'drink you under the table' kind of Irishman. And some writers are more traumatised by things that happened long before they took up the pen. James Lasdun, who defines mortification as 'the default mode of anyone involved in writing or other forms of self-exhibition' is still seemingly haunted by a youthful indiscretion when his unrehearsed rock group performed for his fellow school pupils and was booed off-stage. 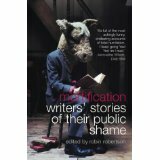 But the bulk of the mortifications described in Robin Robertson's book are not those which authors bring upon themselves but the ones which are contractually inflicted on them by others. It's a necessary part of life that writers must promote their books, through signings, readings, tv and radio interviews, all of these individual miseries being rolled up into the book tour or the appearance at a literary festival. The stories are legion, which in itself is alarming. There are authors who turn up to find that their booking has been forgotten about altogether, although it's more common to find that they've been scheduled against a big-draw author and have no audience – Jonathan Coe was thrilled to find he at least had an audience of one, until the person revealed himself as Ian Rankin, who was supposed to be introducing Coe. William Trevor found himself giving a reading at the Thames Flood Barrier to the organisers of the non-event and his taxi-driver. There are numerous variants on this theme, each quietly horrific in its own way. Other experiences cross the boundary from ineptitude to sheer bad manners, not to mention downright exploitation: for example, Paul Muldoon recounts the story of the disappearing organiser who has neglected to publicise the event, failed to arrange for anyone to 'mind' the visitor, not organised payment and then booked his guest into, literally, a fleapit of a hotel. Mark Doty, by contrast, found himself inveigled into attending a poetry festival which turned out to be more like a gulag, so appalling was the food and accommodation, belatedly realising that he and his fellow poets were a travel agent's bait to ensnare rich Americans into taking this dubious holiday. Val McDermid recounts a particularly unpleasant experience in which the organiser of a panel consistently sneered at the idea of crime fiction and tried to keep the participants away from the 'real authors', while Maggie O'Farrell has the unnerving experience of hearing a radio show host complaining of having to interview 'nobodies', unaware that the link to the studio is already up and running. In which case, it's no wonder that authors so often seem to turn to drink for solace. Generally, this is because that's all they've been offered, authors apparently not needing to eat, ever. Deborah Moggach ruefully notes a third share in a small bowl of dry-roast peanuts. Not surprisingly, there are a number of stories here about bad behaviour as a result of too much complimentary wine, but as David Harsent obliquely observes, it can actually help to fulfil everyone's preconceptions of what a writer should do or say. And as if all this weren't bad enough, there are the audiences … all those people who feel, for one reason or another, that they own you, or are entitled to criticise you, or who've just come in to kill time until it stops raining, or who ask inane questions about nothing much in particular. Reading this collection, you'd need to be made of stone not to feel embarrassed for most of the authors involved. Some of their stories are downright humiliating. In which case, why doauthors do it? This is perhaps the biggest mystery of all, and the one question that remains unanswered at the end of the collection. They all know that this kind of thing happens, over and over, and yet still they hurl themselves into the fray, like lemmings leaping apocryphally over a cliff to their doom. Perhaps it's because they can't not do it, because mortification comes as part of the writing package. In the face of provocation these writers attempt to perform with grace and dignity because … well, because they owe it to their sales figures and because, perhaps, it can never be as bad as this again, can it?